Hi, I’m interested in Concrete Buckets. Please contact me. Thanks! 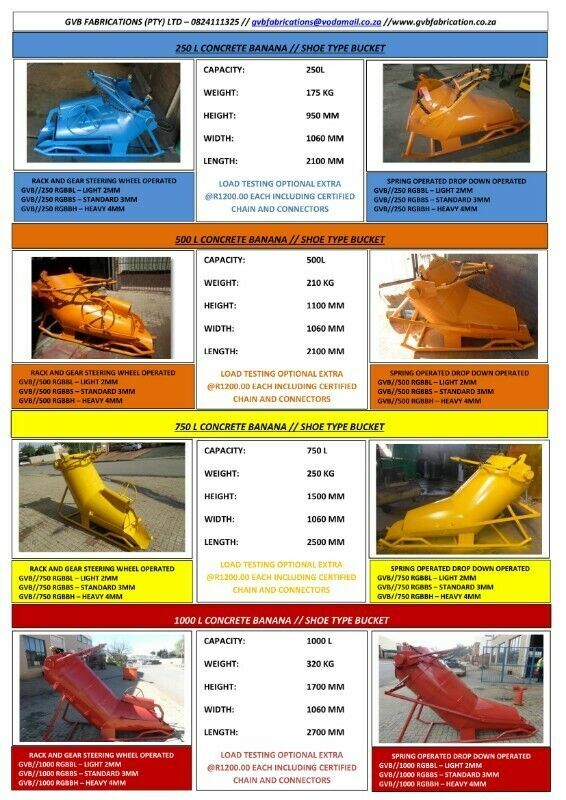 anana Buckets/Concrete Buckets comes in various shapes and sizes. Special features of our Buckets are the following: Our buckets are made from 3mm steel, rolled to prevent breakage and prevent pinch points for staff members. Please contact us for prices and specials. last but still very reasonably priced. chemicals and other pelleted and powder materials. * This versatile bag closer also sews on horizontal surfaces and can be used to join two fabrics. The bag closer is fitted with a plastic handle for insulation. * It also features an oil pump lubrication system with oil lines. * This is probably the best value for money bag closer available. - Extra packet of 10 needles. - Extra 10 rolls of cotton. Diesel Generators - Be ready for Load Shedding! Maverick Generators - your proudly South African manufacturer of quality diesel generating sets. We manufacture diesel generators from 20kVA to 2000kVA. We manufacture all types of generator control panels including Automatic Mains Failure Panels, parallel synchronization panels, ATS and base load panels. We manufacture trailer mounted units up to 2.5 Ton. We are Original Equipment Manufacturer for all leading diesel generator engine manufacturers including Volvo Penta, Cummins, Perkins, Scania, Lovol and FAW. Please contact us for all your standby power requirements. We are a level 1 BBEEE rated company. This item is not stocked on hand and only ordered on special request. The device has been tested by processors to prove the quality of their industry before put it on the market. Full payment or partial payment has to be made in order for us to place the order and to confirm the customer is 100% sure on purchasing as theTitan Ger 500 is an expensive product.